When we first set out to "get ISO 9001"...it seemed immensely complicated and difficult. Everyone we spoke to said that we would regret trying to do it and that it would end up being very expensive for a small business. But then we came across Jane and her DIY Kit. Her guidance and advice simplified it all, and gave us a clear path to follow. When she says she keeps things practical and simple, she means it. With Jane's help, we have successfully completed the ISO9001 certification and have found it an enjoyable experience. We are now more in control of our business than ever and the staff have all embraced the change. I cannot recommend Jane and her DIY kit enough. Follow Jane's approach in keeping it simple and you too will succeed. Bern McIntyre, Director, Steyr Motors (Australia) and McIntyre Equipment. We purchased your program [DIY Pack] and completed the documentation within 6 weeks and received full ISO9001 Accreditation within 10weeks. Admittedly, we did have 'management systems' in action prior to commencing the ISO accreditation process - never-the-less your program greatly assisted our prompt application and approval. Again, thank you for your regular wise information. Thanks for all the support and reminders that you have sent. It's been great and absolutely smooth during our final audit. We have actually received our certificate last month May 2010. The system (DIY ISO 9001) Pack is an effective tool which helped me to manage the audit and NC giving by the auditors. Once again many thanks for your consultancy support and excellent tips and remainder towards getting our ISO qualification. I would never have gone this far without your help. K Wu, SA Engineering, HK. I had my final certification audit last Thursday and Friday and have passed with no non-conformances and just a few places with room for improvement. I would like to thank you for your assistance with getting me on the way to understanding ISO:9001 and everything it entails. It has been a big learning curve over the last 12 months but very rewarding and now we can do works directly for Main Roads etc as we had planned - in fact we have accreditation. Barbara Randle, (name supplied) Qld. The ISO9001 standard, like any other, takes time and effort to understand. The intent behind this standard takes even longer. 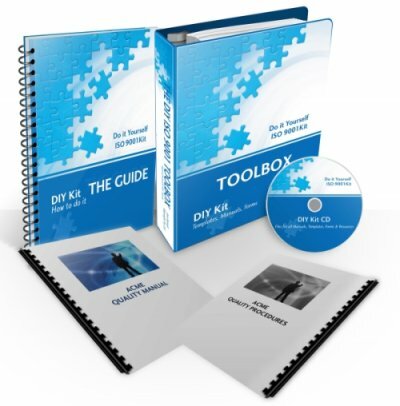 The DIY Pack helps in knowing the key issues a Quality Manual must address and provides samples and guidance on how to create your own Manual. The DIY pack will give you a great start in getting ISO9001 certified. I am delighted with it - don't know what I would have done without it. Tony Chand, (company name withheld by request). Benefits our business - Fantastic! The approach demonstrated by Jane allowed us to greatly accelerate and simplify our ISO 9001 program, and to say we got through in record time would be an understatement. Once the message came across to keep it simple, slim, and sensible, the rest was easy and uneventful, and even quite enjoyable at times to put together. Wastecorp’s quality management system is now lean and lethally efficient, and the company is grateful to Mapwright for keeping it focused towards the ends that were important to us, rather than pondering endlessly on "what the auditor might think". In summary, Jane’s DIY kit and consultancy support were excellent value to say the least. Shane Hammond, Wastecorp P/L, Brisbane, Qld, Australia. I've had the kit for a few months now and I'm very pleased. It works!!! There is a lot of work still to be done and I have precious little time but at least there is something in place and something I can continue to work on when I do get time. What you get with the DIY Pack is a place to start and some really useful information and templates to help you get going on the task, which is often half the battle. I am very satisfied with it. Heath Goldfinch, Corprev P/L, Brisbane Aust. I wish to thank you for such a great product. I tried once before to “jump the QA hurdle” but found it insurmountable. Your product has taken the fear factor away. The system is straight forward, user friendly and appears to be not only effective for QA but will be a very useful tool for the management of this company, namely myself and my husband, to take us well into our company’s expanding future. L.Boulton, Director, Alfex CNC, Brisbane, Australia. The whole set up of the pack was easy to follow, the step by step guide made the process easier than I thought it was ever going to be. I don't think we would have achieved certification nor had the system we do in place without the pack. We could never have achieved such a great result without the DIY Pack and Jane's advice. Tara Edwards, Office Manager, Gytech Pty Ltd, Hawthorn, Vic . The DIY ISO 9001 Pack has been invaluable. I would have been lost without it. It's a fantastic tool for someone who has never written a quality system before. Not only is it a great starting point but the pack guides you through the entire process for becoming 9001 compliant. Amanda Lee, (Company name withheld by request), Gold Coast, Qld. Wonderful! This DIY Pack is exactly what we needed. Simple and easy, but clear and comprehensive. I’m impressed by the thinking behind it, its usefulness, and the great value for money. This is exactly what we needed to explain the whole process, and give us a very practical and workable way to do it. M Evans, Director, Machay Systems P/L, Vic. I am very happy with the product we purchased from you. It provides a really solid foundation to starting a quality system from scratch with only a basic understanding of ISO 9001 and helps you establish a user friendly, easy to follow manual. Definitely the best way to start to control your quality with minimal fuss. B. Randle, King Concreting, Brisbane, Australia. The DIY Pack is definitely a product that everyone should be taking seriously. Not only does it assist with simplifying the process of ISO qualification, it can provide tangible benefit for any business looking to improve internal process. It has aimed us in a common direction whereas before each stakeholder was aiming in his/her direction without any guiding influences. Brett Chapman, Brisbane, Qld (company name withheld by request).